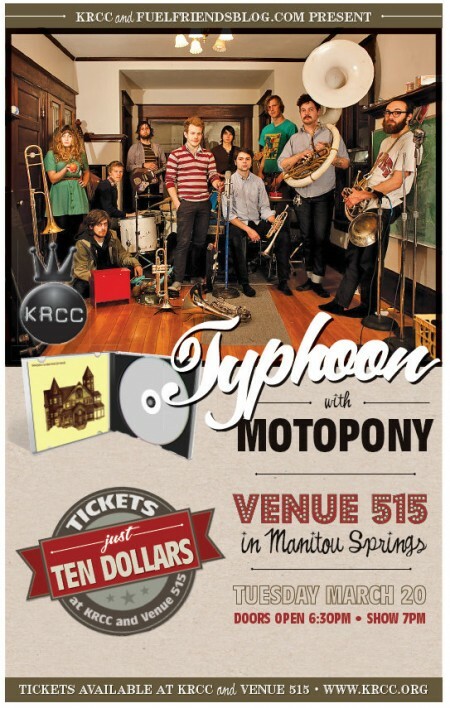 Typhoon and Motopony are coming! I am bringing Typhoon and Motopony to our neighboring hippie hamlet of Manitou Springs, to an art gallery the week after next! This show is guaranteed to be incredible. As in, I personally guarantee it 100% or I will give you your money back (and shake my head slowly as I wonder what’s wrong with your ears). So excited! Tell your friends! Tagged with fuel/friends presents, motopony, typhoon.